How it works: The taste or “doneness” of meats can be determined to be rare, medium, medium well, or well done based on the type of food and the internal temperature reached during cooking. The Maverick RediChek Remote features a transmitter that reads the internal food temperature with a digital electronic food probe, then sends that information wirelessly up to 100 ft away, freeing you from standing next to the oven or grill during the cooking period. When the desired temperature is reached, an alarm goes off. Place the transmitter near the oven or grill. Insert the tip of the food probe into the center of the food being cooked and run the probe’s lead wire out through the door connecting to the transmitter. The wire is a flexible metal sheath and is rated for over 500°F and isn’t hurt by closing the door. The transmitter then reads the internal food temperature and sends a signal to the receiver up to 100 ft. away. 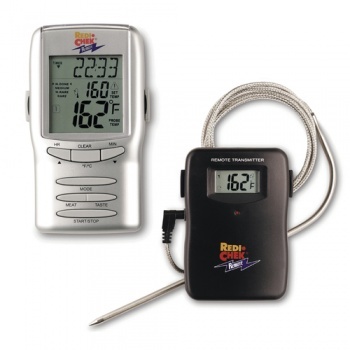 The receiver picks up the signal, and displays: the actual internal food temperature, the “set” or target desired temperature and the type of meat. Each meat type has default taste “doneness” choices for each type of taste (rare, medium, etc.) but you can override any preset temperature and choose your own.